The first thing that pops in our mind, when we think about Italy is Pizza. But, this country has a lot more food apart from pizzas. Here are a few other eats, you have to try when in Italy. Italians are master Pasta makers. There are so many varieties of pasta which come in different shapes and sizes. You will definitely have a tough time choosing which one to eat. Pasta Carbonara, Arabiatta, Pesto, Bolognese, Tortellini filled with squash and zucchini, Gnocchi with sage and butter, lasagna, the list just goes on! The pastas are made fresh every day and cooked to ‘Al Dente’ perfection which Italians take great pride in. Pastas are usually served along with a small bowl of Parmesan. So, add in how much ever you want and enjoy. This is a rich, creamy rice dish, usually made with Arborio rice, wine, butter and a good quality stock. The rice is gradually cooked by adding ladles of stock to get its classic buttery, creamy texture. The risotto varies according to the region. It tastes best when eaten hot. These are rice balls covered in breadcrumbs and deep fried. The name translates to “Little orange” because of its appearance when fried. It is super crunchy on the outside, but soft inside. These are sometimes filled with a piece of mozzarella that ooze out when you take a bite. These are best when eaten hot. These are Italian grilled sandwiches made with baguettes or ciabatta(Italian Bread). The various fillings available are ham, cheese, salami, aubergine/brinjal, tomatoes, lettuce and so on. They are grilled on both sides before serving. This classic Italian dessert is made with the finest, strong espresso and mascapone. Ladyfingers are dipped in espresso and layered with a mixture of mascapone, eggs and sugar. It is usually topped off with cocoa powder. It has the creaminess from the custard mixture and strong flavor of the espresso. It tastes best when chilled. This Italian ice cream is made with milk, light cream and eggs with various flavors. It is different from the usual ice cream because it is not made with heavy cream. More milk and less eggs are used. Therefore, it has less fat when compared to the other ice creams. They are perfect and refreshing during a hot summer’s day. Cannolo(singular) is a crunchy tube shaped dessert. The pastry is rolled and deep fried. The fried pastries are then filled with a sweet creamy filling, usually made with Ricotta cheese. The types differ based on the region. The fried pastry are also some times dipped in chocolate and then filled. This is a sweetened cream, thickened using gelatin and set in a mold. Panna cotta, Italian for ‘Cooked Cream’, can be flavored with vanilla, fruits, liquor, spices or any other flavorings. It is usually served with caramel, chocolate syrup or berry coulis. These traditional Italian biscuits or rusks are made with a doughy mixture of flour, eggs, sugar and almonds. First the dough is shaped into long slabs and baked. They are then sliced and baked again to get a crispy texture. Hence, called twice baked cookies/biscuits. 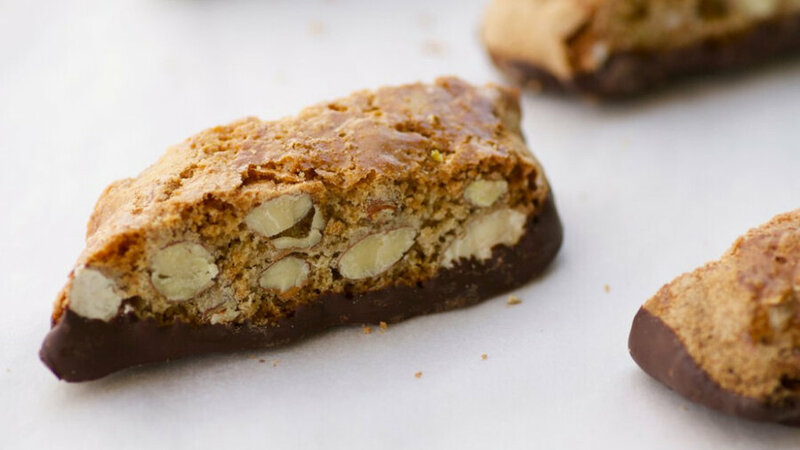 These days, they are made with a mixture of pistachios, hazelnuts, pine nuts etc dipped in dark or white chocolate sauce. Torrone or also called Nougat are typically made from egg whites, sugar, honey and roasted almonds. The egg whites are whipped until stiff. Sugar and honey are heated and gradually added into the egg whites while continuously being whisked. Once, they get a nice glossy sheen, the nuts are added and mixed. Once cooled, they are immediately transferred onto large square molds and cut into smaller blocks . They are sweet, crunchy and delicious.